I don’t know how much detail I should go into here. If I miss something or fail to clarify, please ask! Sunday, there is a huge, huge GAA (Gaelic Athletic Association) senior Irish Football match. It’s our SuperBowl, World Series, Heavyweight title match all rolled into one sort of game. It’s called the All-Ireland. Irish Football is not English Football, aka soccer. It’s a much older game, and is more complicated. I cannot and will not pretend to understand all the rules! But it’s good fun to watch, and is a real Irish game, unlike football or rugby. I believe the oldest Irish sport is hurling. 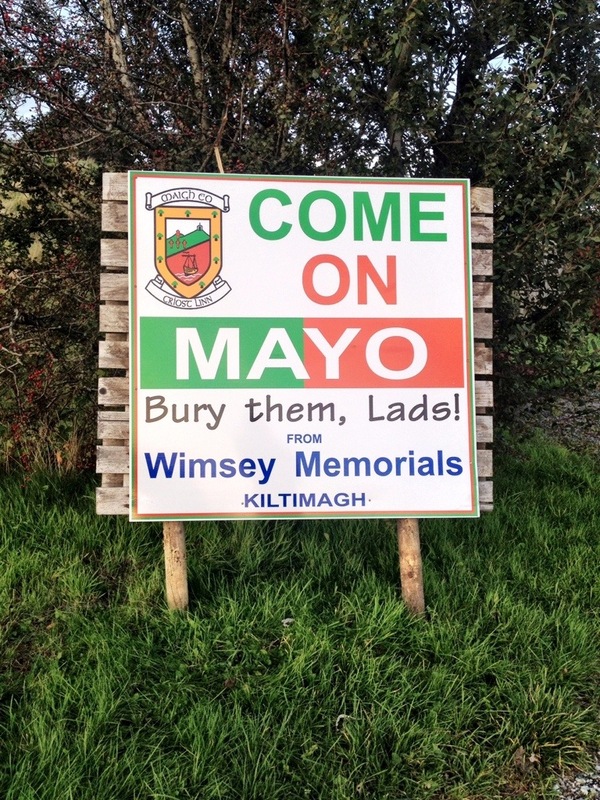 My home county, Mayo, is in the final on Sunday! We haven’t won the title in 62 years, and we just missed it last year against Donegal. As you can imagine, everyone in Mayo is turned up to level 11. We have a flag, a scarf, and a bit of Boy Scout Mayo braid decorating our car, and four flags out front of our house. Most cars and even commercial vans have Mayo flags flying, and all of the local businesses have red-and-green window displays (our county colours) and many, many Mayo businesses have splashed out for big, professional (or not) side-of-the-road signs, wishing luck to our team (and of course, advertising themselves in the process). These signs are so numerous that I barely notice them anymore. However, I was off work for two weeks as I had visitors from the USA, and I hadn’t been down the road I always take to work. So on Monday, I found out the road had been partially repaved (yay, except that they made the no-passing zone longer for no discernible reason – it’s not a bother, I’ll ignore it and pass those slow fuckers anyway). I also got to see a lot of new “Hon Mayo!”, “Mayo Abu”, and “Up Mayo!” road signs. Most are the usual. But this one – oh, this one! It has to be the best ever. Wimsey’s Memorials – a company that makes and engraves headstones – showing that they have a wonderful dark sense of humour. If I’m allowed to be memorialised in the town cemetery (up for debate as I’m not a Catholic), I’ll insist that Wimsey does my stone, just because they are dammed funny. All their wars are merry and all their songs are sad. Everyone’s getting into the spirit, woooh!